1. 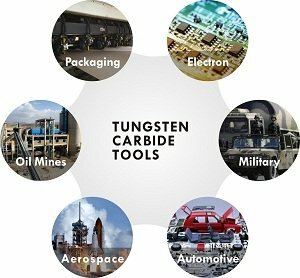 What is Tungsten Carbide? Tungsten Carbide is a super hard artificial metal. It is made by the powder metallurgy process of hard compound powders of refractory metals (mainly WC and W) and of binder metals ( Cobalt and Nickel) and small amounts of microelement (Tac, Tic). Tungsten Carbide with a high hardness, wonderful wear resistance, good strength and awfully toughness, tiptop heat resistance, superb corrosion resistance and a series of excellent performance. Especially its high hardness and wear resistance, even under the temperatures of 500 ℃ also can remain unchanged , Still have very high hardness at the temperatures of 1000 ℃. 2.The development of Tungsten Carbide? Especially in Manufacturing molds and measuring tools areas ,the life of carbide tools is 20 ~ 150 times higher than alloy tool steel. Tungsten carbide tools can process materials with hardness of around 50HRC .It has high hardness, but brittle also. So, it is difficult to make a complex shape, often made of simple blades or components, using welding, bonding, mechanical clamping and other methods installed in the knife Body or mold body to use. As industrial consumables, cemented carbide can be applied to almost any industry, such as military, aerospace, automotive, oil mines, construction, machining, electronics, packaging industry, fashion jewelry, etc., mainly for cutting and wearing.